I had made the little strips of triangles for the side halves of the Clamshell Pickles a long time ago and they’ve been sitting waiting, all this time, for me to finally get the fabrics chosen and half Pickled Ladies printed for each one. All that was left was some nice curved piecing to add the little strips of the triangles to the half clamshell pickles, which went very quickly, and all the ones needed for one side are now done. Using the window template made it very quick to find fabrics that worked for the side halves. The extra bit of the final white triangle will get cut off when I add the border, but I”m leaving them as they are until then. I cannot choose favourites among these. 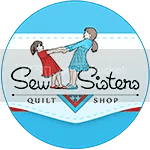 Some have been used a lot in other quilts – like this one, which was in quite a few of the blocks in my New York Beauty top. I don’t think this one has been used in anything before. I know this one hasn’t – it was taken from a border print. This definitely has been – it’s a big part of an unfinished Drunkard’s Path project. I”m not sure if this one has been used before. This one was used in my Joseph’s Coat top, which I have finished but not managed to photograph yet. This is an old Robyn Randolph print that I absolutely love. I had only a small piece of it and have used up every scrap. I’m pretty sure this one is in the Joseph’s Coat top too, which is one of the things I have to get photographs of and blog about soon. Jake, however, was very curious about something out on the roof garden. We’ve seen our first robins of the season and the leaves on the crab apple tree are starting to open – all very welcome signs of spring! I cannot choose a favorite either! These are wonderful! It is great to see you blogging and inklingoing again! Thank you, Linda! Were it not for Inklingo there is no way I’d be making this quilt. Being able to make the window templates so easily is just one more bonus to Inklingo! Very nice . Love to see your progress. It’s almost like show and tell in a quilt group. 😀 Looking forward to seeing a photo of your Joseph’s Coat. That’s one that’s been on my wish list for a while. Oh, Sandra – you’ll love making Joseph’s Coat using Inklingo! 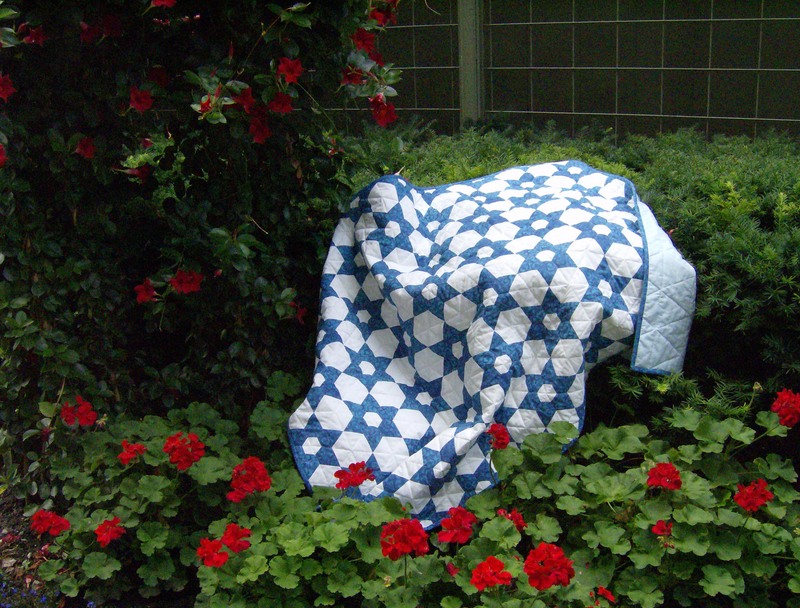 It’s absolutely addictive to make – I know, because I wasn’t planning on making a quilt anywhere near as big as I have. But I kept wanting to sew more of it as I finished a row so just kept going and going, sort of like the energizer bunny! LOL Oh, for good weather so we could take a picture of it out on the roof garden – it’s way too big to try to get anywhere near a decent photo indoors. I’ll soon start adding all the edge pieces to the main body of the Pickled Ladies top – and then the border. I am also looking forward to seeing Joseph’s Coat…this one is on my wish list. Your pickled ladies are gorgeous, of course! I can’t wait to get a good photo of the Joseph’s Coat – but that is going to require some decent weather so we can get out on the roof garden with it. It’s absolutely addictive to sew – I really didn’t want it to be finished but finally had to stop! Cathi, that is going to be very pretty…. are you sewing this one by hand as well? 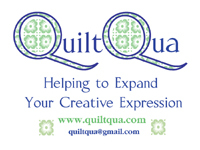 I’ve got 4 quilting projects going at the moment. Pretty soon that will end, because the great outdoors is calling me.